Inder Loves Folk Art: Winter Roly-Poly. Happy new year, readers! 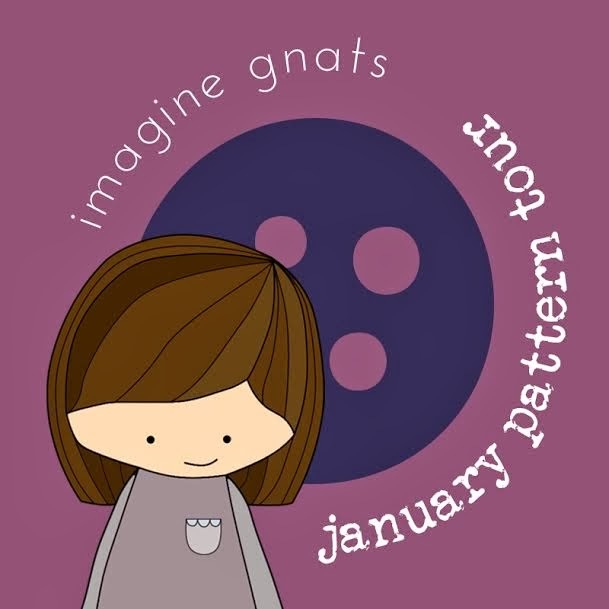 I am stoked to be the first stop on Rachael Gander's Imagine Gnats Pattern Tour. I have enjoyed testing several of Rachael's patterns and watching her graduate from sewing blogger to pattern designer in the past year or so! I have been wanting to make Maggie a cold weather appropriate Roly-Poly Pinafore since I made her a warm weather version last summer. Initially I thought this would be in corduroy (always a favorite), but on further reflection, decided that this would be the perfect use for the teal fleece I had leftover from Joe's Flip Vest. A fleece vest turns out to be an extremely useful garment in my part of Calfornia, which is very often cool but very rarely cold. I don't know about other children, but my kids resist jackets, I suspect because they impede play. 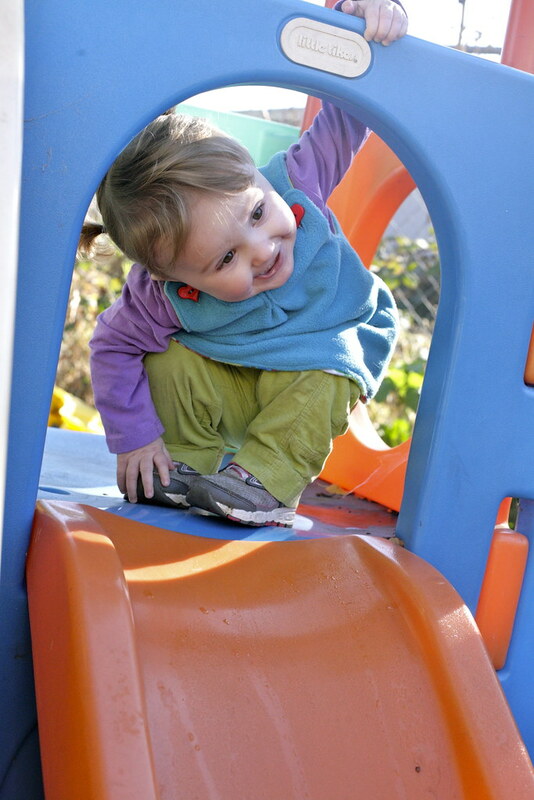 A fleece vest keeps the kid warm(ish) while still allowing full range of movement. And the Roly-Poly pinafore turns out to be just as adorable and useful in thick fleece as it was in lightweight fabrics for summer. Of course, as it happens, I made this pinafore just in time for 70 degree weather! It has been gorgeous and warm lately here. In fact we have gotten hardly any rain this winter at all, and while I am not a great lover of wet weather, I am also not a great lover of summer drought restrictions. Hopefully we'll get some rain soon so that I can water my veggies this year! I know I'm biased, but gersh darn this little girl is adorable in her piglets, with marker on her hands, right? Lately it seems like she is growing up in front of our eyes, developing more personality and more vocabulary every day. 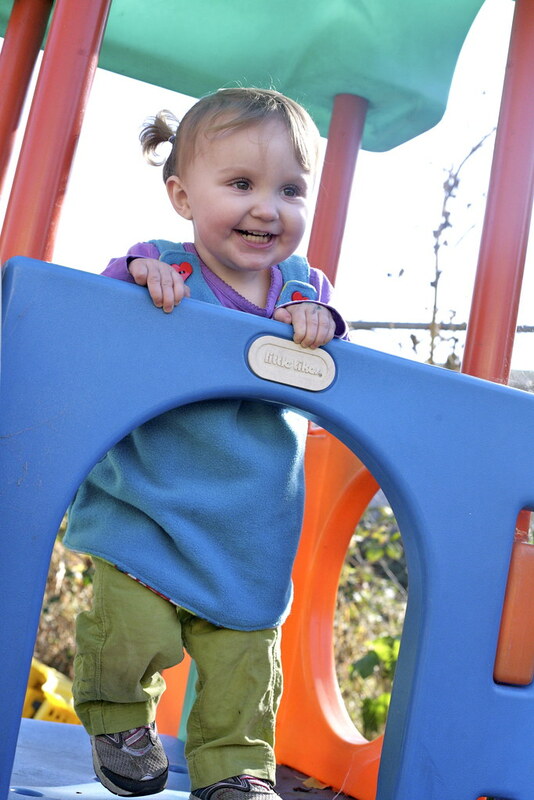 While it is a bit bittersweet to see her growing out of her babyhood so quickly, she amazes and delights me every day. She is not quite 18 months yet and already combining words into phrases. Her favorites phrase is "no, Mama!" of course. Since Joe was a very late talker, we do not take these things for granted, so I can enjoy even Maggie's loud and forceful "NOOOO!!!!!" with delight. Like, "Listen, Steve, Maggie is lying on the floor, kicking and screaming 'no Mama, no Mama, no Mama' at me! She's combining words! Great talking, Maggie! But also, no, honey, you cannot play with the tension knobs on my serger." Ah, the joys of the second child. We really are so much more relaxed now. Anyway. As I've said before, this is a really easy, fun, and fast pattern to sew up. It would be a perfect first project for someone just learning to sew, but it's useful and interesting enough for us old-timers too. It is also a great use for your fun buttons - like the cutesy heart buttons I used here. One great benefit of this style of top is that it seems to fit forever - I have high hopes that this will still be wearable next year, when Maggie will be running around the playground at preschool with Joe. Most of the supplies for this vest - the no-pill fleece, the flannel, even the buttons - came from JoAnn's. It's not often I can say that, since I actually shop there pretty infrequently (I am blessed to have several independently owned fabric stores with nicer fabric that are closer to me), but they really do have the best selection of fleece in town. Okay, fleece is not my favorite fabric to sew - in fact, I actively dislike sewing with the stuff. I know people consider it easy to sew, but it tends to get stuck under my presser foot (I wonder if my teflon foot would help? ), is dang-near impossible to make buttonholes in, and dulls my needles and scissors. But it is warm and washable and drizzle- and fog-resistant, so it's no wonder it's practically a winter staple for West Coasters. It also comes in lots of bright and cheerful colors, so there is that. At any rate, if I must sew with fleece, simple and straightforward patterns like the Roly-Poly are the way to go. So there we have it. A simple, cute, warm layer that allows Maggie to play her sweet, happy, chatty little heart out! Thanks to Rachael for making this lovely pattern and including me on her tour. love! love! love! she is getting so big and even more adorable :) and roly poly as vest? fabulous!! Thank you Rachael! It's such a fun pattern to sew and it actually makes a PERFECT winter layer. so, it's not just the mom bias, Inder. M is adorable. I want to eat her up! And you guys are having warmer weather than we're having in Texas. Our December was cold (40s) and grey. Having left the midwest 8 years ago now, I am officially wimpified- to both the cold and the lack of sun. Our kids are too and haven't want to play outside nearly as much. I can't wait for the 60 and 70 degree weather again! Haha, we definitely think 40s is cold here too! We are pretty wimpified as well. Thank you! I love that this pattern "girled" up these fabrics a bit. It makes a fun combination! Right? 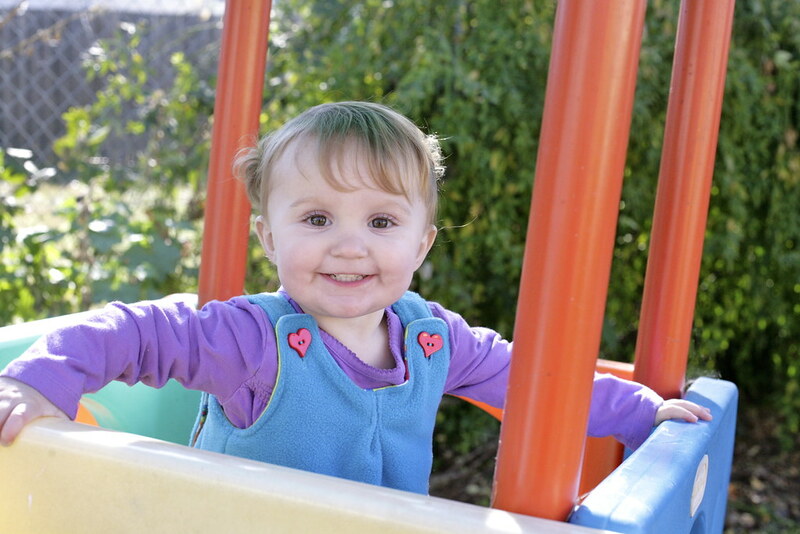 Every time I do her hair in piggies, I pretty much die of cute every time I look at her. It's almost too much to bear. Such a cute idea to winterfy it! It looks fantastic! And she really is precious (I love the sparkle in her eye)! "Me pie!" Hahaha! Yes, it's really fun. Since Joe's speech did not develop on a "normal" trajectory, we didn't really experience it with him (he didn't say "mama" until he was over two! ), and we are enjoying it SO MUCH with Maggie. 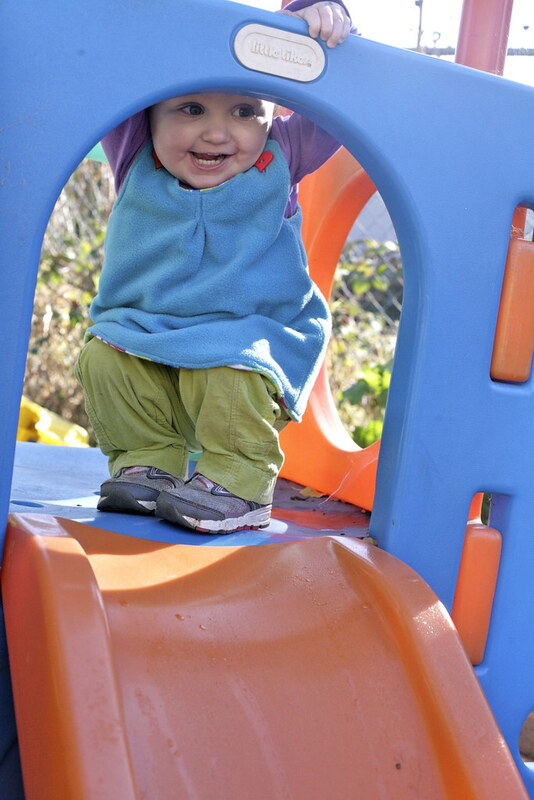 That is a wonderfully cozy and playful little outfit! And your daughter is so sweet! Thank you! I am loving your blog, btw! Oh crikey she's ridiculously adorable in all these photos! Hmm, I think that's a better face of appreciation than the Icecream Dress, ha! The one thing I have sewn from fleece (and I did not enjoy the experience either) was Clem's panda hoodie, and that has seen so, so much wear it was totally worthwhile. Yes, so so practical! Just really kind of unpleasant to sew. 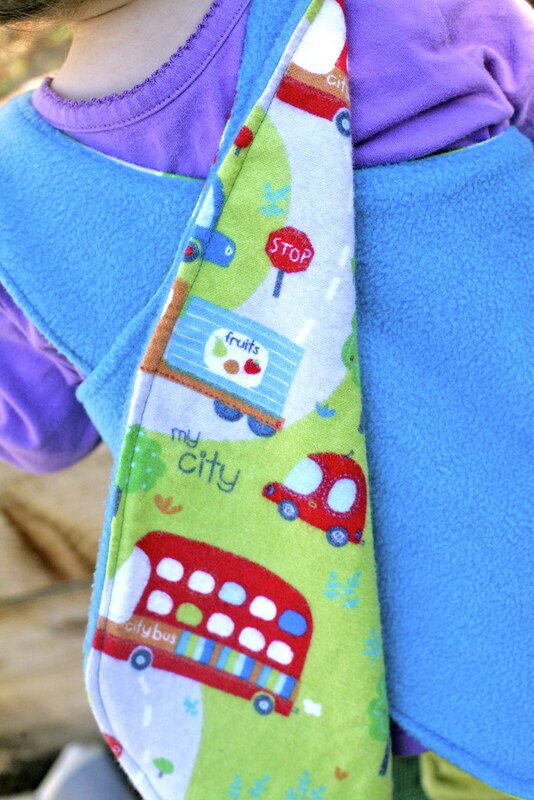 Love the pinny too - fab idea to make it in fleece. The colour looks great on her too. Thanks Justine! She is pretty. darn. cute. And yes, I love her in blues (puke green, not so much). Love this pattern, would love to make for my granddaughter, who is right about 18 months also. (born last part of August). What a great idea to make with fleece, living in OR it would be perfect! Ah yes, Maggie was born in July, so they are very close in age! Just FYI, the version above is in the "6 month" size, which is plenty big enough for Maggie. I made her a 12 month version last summer, and it was HUGE. I gifted it to my 3 year old niece, who is actually big for her age, and it fit her. So I would say err on the small side! I'd love to see your version - post it on Rachael's Flickr group! 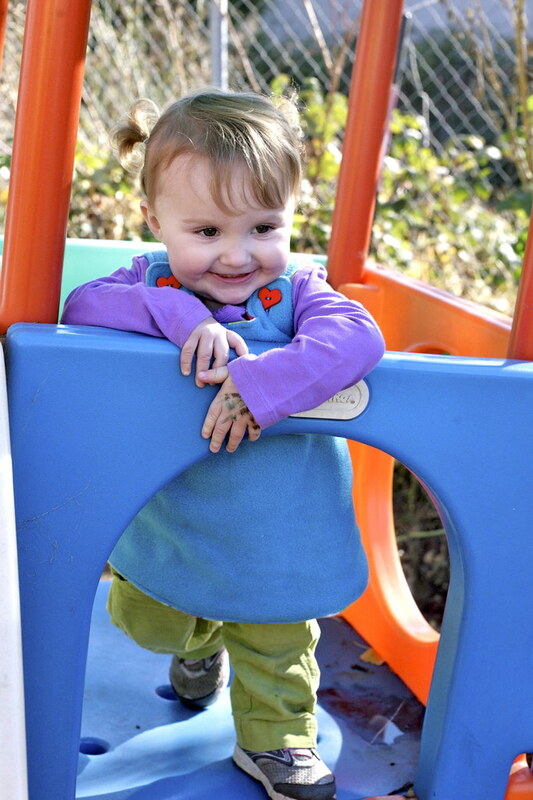 She and the pinafore are both adorable! And I'm also enjoying warm weather in SoCal but hoping for rain for the same reason!